Residential heating oil and propane prices have started the winter heating season at levels similar to last winter’s levels, while inventories of both fuels are near or above five-year highs for this time of year. 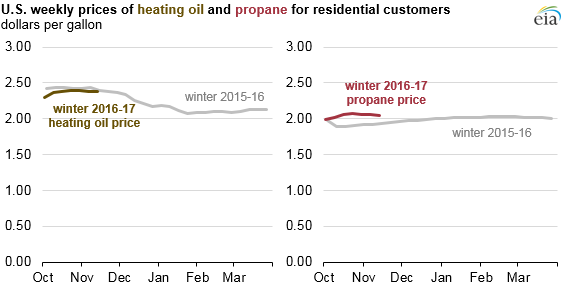 On average, prices for residential heating oil and propane during last winter (October 2015 through March 2016) were the lowest in at least a decade. The U.S. Energy Information Administration's State Heating Oil and Propane Program (SHOPP), which is a joint effort between EIA and state energy offices, collects state-level residential heating oil and propane price data in 38 states where residential use of heating oil and propane is common. 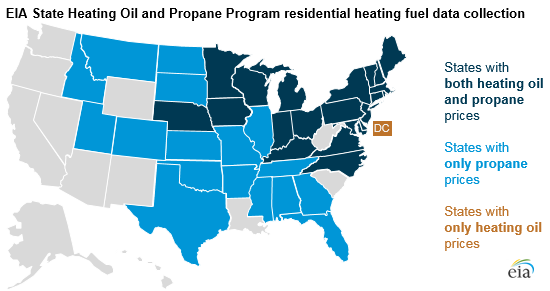 SHOPP collects residential heating oil and propane data in 21 states. In 17 additional states, SHOPP collects propane prices but not heating oil prices, and in the District of Columbia, heating oil prices but not propane prices. Based on projections in EIA’s Winter Fuels Outlook, EIA expects households that use heating oil or propane as their primary source of heat to have higher heating costs this winter than last winter but still lower costs than the average of the previous five winters. This projection is based on expected increases in residential heating oil and propane prices as well as winter temperatures that are expected to be colder than last year, based on the National Oceanic and Atmospheric Administration’s outlook for winter weather. EIA’s Heating Oil and Propane Update webpage also includes wholesale propane prices in some states. 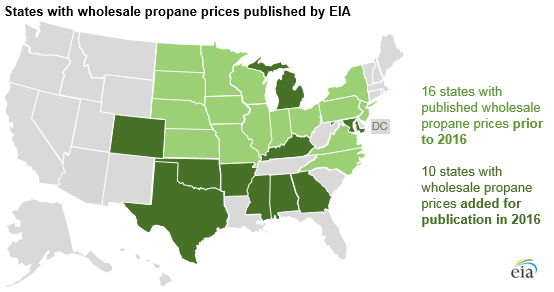 This season, EIA is expanding publication of wholesale propane prices from 16 to 26 states, including prices in the Gulf Coast and Rocky Mountain regions for the first time. The new wholesale propane price data are provided to EIA by the Oil Price Information Service. The addition of these 10 state-level wholesale propane prices will help federal and local government officials better understand price fluctuations and improve their ability to monitor and respond to significant price changes. Unlike retail natural gas and electricity, which are both distributed through utility companies, retail heating oil and propane are sold by independent dealers. These dealers and their customers can face considerable supply and price uncertainty, particularly in the event of inclement weather or supply disruptions. However, this year’s high levels of heating oil and propane inventories could moderate any potential effects of inclement weather or supply disruptions.